If you are a local reader you are definitely going to want to check this out! 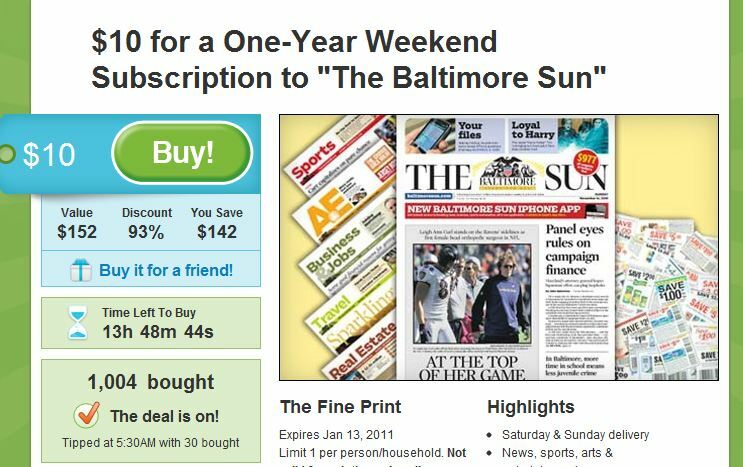 Today’s Baltimore Groupon is for a full year’s weekend subscription to the Baltimore Sun for ONLY $10! This is the newspaper that has all the best coupon inserts and it is vital if you want to be an avid couponer. The coupons will pay for the $10 subscription in the first week (trust me, I save over a hundred dollars every week)! This is originally $152 (a 93% savings!). If you are just even considering starting to coupon or need to renew your subscription, there will be no better time. Haven’t heard of Groupon? Check out my post about it here (scroll down to the fourth post)! You have nothing to lose on this deal; I would subscribe 100 more times if I could. I have bought from Groupon before and have been very satisfied. This deal is ONLY good today and while supplies last, so do not wait! Sign up so you can start getting all the coupons I post about for the deals! https://i1.wp.com/savvywifehappylife.com/wp-content/uploads/2011/01/Groupon-Baltimore.jpg?fit=743%2C467&ssl=1 467 743 Brandi https://savvywifehappylife.com/wp-content/uploads/2016/09/SavvyWifeHappyLife-logo-2.png Brandi2011-01-13 10:12:202011-01-13 10:14:29Today's Baltimore Groupon! It’s a Contest! $5 Amazon Gift Card! Swagbucks Games!